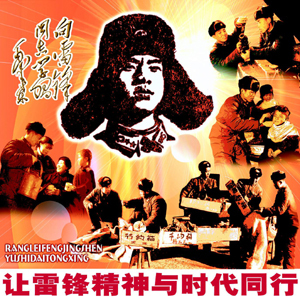 Danwei has a post on Chinese gaming giant Shanda Entertainment’s recent educational online game, “Learning from Comrade Lei Feng.” Lei Feng was a model of self-sacrificing youth, held up by the Chinese Communist Party as an inspiration to millions during China’s Cultural Revolution. a chance to see Chairman Mao at magnificent Tian’anmen Square,” said a 12 year old Chinese player. Broken Toys blog has a wonderfully detailed write-up, and Slashdotters have plenty to say as well. Why not make a game where Mao Zedong is the lead character and it’s about liberating all of China? Games are about entertainment and relaxation. It’s not right to make everything about education. parent: Where did you go after school? child: I went to study Lei Feng. parent: You’re making progress! Where did you go to do your good deeds? child: I went to an Internet bar to learn from Lei Feng how to sweep floors. parent: To an Internet bar to learn from Lei Feng how to sweep? Can’t the people in the Internet bar sweep their own floors? child: Yes. I went online to play the Lei Feng game. parent, angrily: Now Lei Feng is bad, too! Going online to trick children! No more learning from Lei Feng for you! Now get home and start studying! How many parents have cried, how many homes have been broken, how many youth have destroyed their educational careers…while the businessmen laugh. Online games are a drug like heroin, a form of social pollution, and should be eradicated. Nobody’s going to play this game anyway. What an idea! It’s harming our younger generation! Lei Feng would never agree with this! What a stupid idea! It’s all just to make money!